Nintendo are running another one of those refer a friend promotions similar to what they did with Monster Hunter. Thousands of mayors across Europe are already enjoying a new laidback life in Animal Crossing: New Leaf on Nintendo 3DS, and now you can introduce a friend to the fun with the Animal Crossing: New Leaf: Welcome a Friend Promotion! If you register Animal Crossing: New Leaf with Club Nintendo before 22:59 (UK time) on 7th September, you’ll be able to receive a Recommendation Code which you can pass along to a friend. If your friend registers a Nintendo 3DS XL system between 23:01 (UK time) on 6th August and 22:59 (UK time) on 7th October 2013, and enters the Recommendation Code before 22:59 (UK time) on 7th October 2013, he/she will be eligible to claim a free Download Code for Animal Crossing: New Leaf on Nintendo 3DS! My boy is buying a 3DS this week, anyone got a code they could send me? Make sure it's a 3DS XL or recommendation codes won't work. Do I put the recommendation code in the eShop on the 3DS? Hoping somewhere has a crash sale on 3DS XL's now! i want one so badly. Anyone got the recommendation code link for the club nintendo website? When you log in and have already registered the game its a banner at the top of the page, thats where I got my code. Fab idea by nintendo this is.this is a similar deal that would give the wii u a good kick in the right direction. Got my Code, now how do I register my System? Edit: Never mind, just found that it's the big/thicker booklet. 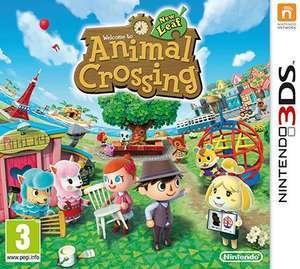 Seems pointless, basically buy a 3ds XL and get a free game *IF* you have a friend with Animal crossing! Got my recommendation code - guess i'll just bang it on Ebay and try my luck. Just enter the Animal Crossing Club Nintendo Code when you register for Club Nintendo (thin booklet). thats a shame its only from the 6th august as i knew someone who regd there console last month.that code would have been good. Hmmm, I have one code going as I registered this game for my daughter but I had 3 for the last promo like this for Monster Hunter and gave them away on here to 3 individuals one of whom didn't even have the manners to acknowledge never mind say thank you when I sent them the code so do I bother giving this code away? Excellent, been looking to get a copy for the other half as im buying a console for his birthday so seems like if i use my animal crossing code now (as i did not register it before) when i get him the console he will get the game for free - saves me from buying it!! If anyone has a spare code it'd be gratefully received, bought my daughter a 3ds xl for xmas so hasn't been registered yet. I've got a recommendation code, but cant see where to enter it to redeem it. Can anyone help? Wouldn't mind a code if anyone has one free. Thanks. I've got a recommendation code, but cant see where to enter it to redeem … I've got a recommendation code, but cant see where to enter it to redeem it. Can anyone help? Ensure that your Nintendo 3DS or Nintendo 3DS XL system is connected to the Internet. For more information on how to connect your Nintendo 3DS XL system to the Internet, see our Nintendo 3DS Support page. On the HOME Menu of your Nintendo 3DS or Nintendo 3DS XL system, select the Nintendo eShop icon to launch Nintendo eShop. For more information, see our Nintendo eShop page. Scroll to the far left of Nintendo eShop and select 'Settings/Other', then tap 'Redeem Download Code' – enter your free download code in the box displayed and select 'OK'. Follow the on-screen instructions and select 'Download' to start the download process – you can then choose to download the game immediately or download it while your Nintendo 3DS system is in Sleep Mode. Whichever method you choose, however, please note that your Nintendo 3DS system will need to be connected to the Internet for the duration of the download. For more information on downloading games from Nintendo eShop, see our How to buy games page. For further information regarding this promotion, please refer to Terms & Conditions of this promotional website. Nintendo has sent me a 24 digit code. Is that normal? I bought a new 3ds XL from game last week but there wasn't a registration … I bought a new 3ds XL from game last week but there wasn't a registration code and game won't help. Is there anything I can do? Contact Nintendo via the club nintendo website, they will want proof of purchase and for you to link you 3ds to your club nintendo account. they will be able to give you the details on how to do it. this is fantastic, my friend is getting a 3ds xl soon as well! Could someone share a code pls? Thanks in advance! Why oh why did I not see this before I went out this afternoon and bought a 3DS XL and a download version of AC........which of course is non-refundable. Poop! I have a spare code which I'm more then happy to pass on. Just PM me. All I ask is that you show me that you registered your device after the promotion started, I don't want to be giving my code out to someone who isn't going to use it or will pass it on themselves for profit. Anyone got Cabana Wall or Floor...... I mean join the HUKD ACNL thread! Hahaha, lots of cheapskates on here (well, this is HUKD after all lol). If you "really" wanted the game as you say you do, then you could easily spend 20 or 30 quid on it, it's not that expensive.